Is English still a nightmare for you? English is the second language of our country and is extensively used throughout the nation. If you feel too shy to speak to anybody due to your poor English speaking skills, then we have a good news for you. CBitss Technologies provides the best English speaking course in Chandigarh at a very nominal price range. English is an official language of India and almost all of the corporate business needs employees who are fluent in English. Also, digitalization is highly in demand and 99% of the work is done on computers using English language only. 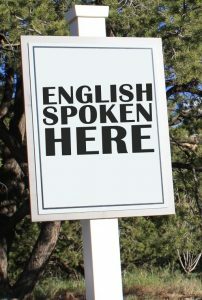 Thus, it is of prime importance nowadays to know how to speak English. There are many among us, who can write in English because while writing, we get time to make and break our sentences in order to convey the message effectively. But while speaking, we only have a fraction of seconds to convert our thought into speech. If we do not speak properly, then our words would not be effectively understood by the listener and we would be considered as a poor speaker. communicate your ideas during a job interview even if you know all the answers. Or while in a job, you would not be offered the opportunity to meet with the client. All these things bring negativity in one’s mind and the person gets demotivated. Before you are surrounded by such thoughts, take a step forward in the right direction and look for the best academy providing English speaking course in Chandigarh. Another crucial step is to choose the correct guide for learning English. Why CBitss for English speaking course in Chandigarh? CBitss Technologies is one such platform that grooms the students according to their requirement. Our training team is well experienced in English teaching. We analyze our student to check their knowledge about English and then start our training. We teach the basic English sentence structure to the student as it really important to understand the Grammatical aspect of the language. GD or Group Discussions is a very healthy way of putting up your ideas in front of different people discussing the same topic. During GD, people sometimes negate a view point or support it. It is also a crucial part of many job interviews where candidates are shortlisted according to their performances in the GD round. Moreover, a sense of healthy competition is also sensed during this process. So now you see why it is important to take part in GDs. Our English speaking course in Chandigarh makes it a point that your hesitation of speaking during a discussion is curbed so that whenever you enter the corporate world, you do not face any language barrier. Speaking in front of a group of people who are all-eyes and all-ears to you can be sometimes challenging while using a different language other than your mother tongue. You need not be at your wits end if you are master of that language. CBitss Technologies trainers give you various topics for English speaking and assist you with the speaking so that you do not have jitters while speaking in real-life situations and that too while leaving a lasting impression on your listeners. You might be thinking what would be the use of story writing while learning English. Well, this aspect helps you in making a proper sentence which is correlated. So that you do not wander off from the topic you are speaking on. These things are not included in any job interview, but these surely enhance your speaking skills. Whenever you are telling a story to someone, your voice modulation plays an important role, whether you have to soften your voice or you have to make it coarse while communicating. Our course is budget-friendly and while you are associated with us, you will feel the difference in our training process as compared to other service providers. Our team holds a long experience in training people from different backgrounds. If you feel that you do not know English at all, have faith in our experts, we will teach you English from the very basic and then move to advanced level in the course of time. With your efforts included, you will your personally feel a very positive change in your personality that will help you move with this fast paced world. We also provide quality coaching for IELTS and PTE for people who desire to move abroad. Both of these courses are further depended on the English language knowledge of the candidate. Thus, if you wish to polish your English skills for these courses, then also you can opt for our English speaking course in Chandigarh. Call us at 99887-41983 to book your classes with us or visit our visit our website to know more about CBitss Technologies.